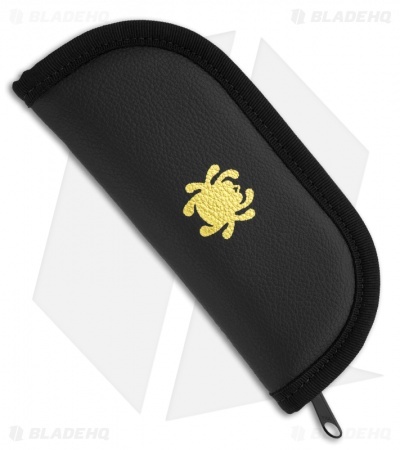 Spyderco's padded zipper carrying pouch is just the thing for storing collectible, expensive and easily scratched knives. 6.5" long and 2.75" wide, the pouch holds a folded pocket knife up to four inches in length. Made of black mock-leather, it's embellished with a gold SpyderBug. All perimeter seams are tightly sewn and edged with a vinyl sizing strip for added security. Inside is plush foam padding with non-scratching black nylon liner. The zipper runs the full length of the pouch for easy access and added security. Spyderco makes the best cases! Awesome case from BladeHQ! Perfect fit for my larger Microtechs, Benchmades, & Spydercos!